The American Society for Testing and Materials (ASTM)  and Association for the Advancement of Medical Instrumentation (AAMI)/ International Organization for Standardization (ISO)  committees have drafted or passed standards [38, 39] to address the release of particulates into the vasculature by drug eluting stents during deployment and implantation. A new AAMI committee  addresses these issues for all implantable medical products. This paper focuses on the concerns of these committees as well as those of stent manufacturers and academicians. A comprehensive approach to the experimental evaluation of particle shedding includes considerations that address equipment choice, system sterilization, test frequency, monitoring of stent deflection, establishment of baseline or background levels of particulates before stent deployment, deployment mechanisms into mock vessels, system hydrodynamics including overall impedance, calibration of all systems including laser counters, filtration of shed particles, and approaches to data analysis. One of the most important decisions that an investigator must make is how often the sampling is done for particulate shedding. In general, there are three temporally linked approaches. The first is simplest and yet the least informative with respect to the time course of shedding. In this case, a sample is taken from the bulk solution at the end of the acute or chronic (durability) test. The second involves the sequential sampling of the bulk solution throughout the test. The last and most informative approach is a continuous monitoring approach. This paper will focus on each step in the generation of the protocol and give pros and cons to each option. Throughout this paper, data from an actual experiment will be presented. For over a century, it has been known that the exposure and/or inhalation of particles can cause disease. One of the earliest examples of this is the famous Black Lung Disease often suffered by coal miners. A more modern version of this problem cropped up nearly fifty years ago when asbestos exposure led to a cancer called mesothelioma. This pathology is caused by small particles of asbestos, and is more a function of the size and shape of the asbestos particle rather than its chemistry . Shortly after that, data began to be collected indicating that medical implants, particularly orthopedic implants, were shedding particles that were responsible for toxic effects. These toxic effects resulted in, among other things, bone necrosis leading to the failure of the implant [2-8]. Other types of airborne particulates have been shown to cause a variety of pulmonary diseases. Some of these cause inflammation while others cause more classical types of toxicity [9-11]. In more modern times, the excitement generated by the development of nanoparticles and other nanomaterials has been somewhat dampened by the recognition that many of these particles are extremely toxic [12-26]. Even more disturbing has been the recent realizations that certain medical procedures (including the deployment of stents) do, in fact, introduce particles that could lead to pathological events [27-34]. More recent concerns have been voiced that the implantation of other types of medical products could shed particles leading to unknown disease states. During its lifetime, a material coated on modern types of intravascular stents might shed off particles, causing not only occlusive problems, but also perhaps more subtle toxic effects associated with small size. To address these issues, several standards committees have been formed that are attempting to develop procedures to assess the tendency for a variety of medical products, including stents, to shed particles after implantation [35-37]. This paper will focus on research undertaken to work out procedures and protocols, modify equipment, and develop overall approaches for evaluation of the durability of drug coatings on stents, the tendency for particles to be shed during stent deployment, and the tendency for non-coated stents to shed particles after implantation. The first challenge in developing experimental protocols to address particle shedding is a consideration of the kind of testing equipment needed. In general, the equipment is composed of four major components: The tester itself, the particle counters, the filters, and the adjunct flow system. Pulsatile Tester: The first component is the tester itself onto which the samples are mounted (Fig. 1). This device can be used to evaluate durability characteristics of coated or uncoated stents, as well as to investigate particle shedding during acute or chronic phases of deployment or longer. The tester requires appropriate sample mounts as well as driving units that can produce either steady state or pulsatile flow. Essential to a basic tester is a speed-controlled motor, temperature monitor, cycle counter, temperature controller, pressure transducers (if necessary), and some technique to monitor stent deflection. If the particle counter requires steady flow, then a modification to the tester may be required. Material choice will need to address corrosion and sterilizability issues. Software for the tester will need to monitor and record all pertinent parameters to assure the numbers of cycles recorded have indeed been delivered. This can be done with the appropriate alarm and notification systems. Additional functions of the software include calibration of the various monitoring devices as well as data logging of all experimental parameters and a temporal logging of particle counts. Versatile software allows a number of “bins” into which the counts can be divided by particle size. In order to monitor individual samples, the flow system must separate just distal to the pulsatile pumping system, but proximal to the mock arteries. Particle Counters: Nearly all particle counters require steady flow. When durability upon exposure to pulsatile loading is needed, the pulsatile flow must be converted into steady state flow before entering the particle counters. This means that the tester must include components that combine to give an overall impedance that sends steady flow through the particle counters. All components that make up the flow system work together to produce that resultant systemic impedance. These include the compliance of the pumping chamber (bellows), resistance of connectors and elbows, compliance of mock arteries, resistance of all connecting tubing, occlusivity of the particle counting chamber, and settings on the input of the flow meters. The plumbing distal to the flow meters also has a limited impact. A final adjustment to the flow can be accomplished by modifying its total impedance with capacitance tubes of a specific frequency response, compliance and length. Exiting from the pulsatile tester system and modified somewhat by the flow meters on the distal port of the counters, the flow is directed in a steady state fashion into the particle counters. A major challenge in developing the instrumentation is the need to adapt standard particle counters as received from the manufacturer. The particle counters must count not only the numbers and sizes of particles, but also do it in fluids commonly used to test coated or uncoated stents. The modifications to the counters have included not only electronic issues, but also counting chamber materials and data acquisition techniques that can greatly affect lost particle counts during data logging times. Particle counters from four major manufacturers were evaluated and a partnership with a company in Georgia currently produces customized particle counters for this system. Distal to the particle counter is a standard flow meter that must be calibrated and contributes to the overall impedance of the hydrodynamic system. Filters: In most cases, it is necessary to filter the fluids circulating through the tester before they are allowed to return for a next cycle. The filters are 0.2 micron high-flow filters which allow for collection of particles and, if desired, for later microscopic or chemical analysis. The presence of these filters are vital during the clean out stage discussed later. Adjunct Flow: The final portion of the loop, which is reached after exiting the primary filters, is the steady state flow pump, heater, and capacitance tank. The system is set up to control the steady state flow through the test system and the particle counters with a series of valves and bypass loops. The system is designed such that the fluid can be passed through one final filter before returning to the driving bellows, assuring that no particles have been introduced by various connectors, valves, etc. Pre-Setup: Prior to setting up the acute or chronic coating testing, target experimental parameters must be decided. In this case, a true deflection of the stent is always used as the target. The true stent deflection is established on a separate instrument as follows: First, the stent is deployed into a silicone mock artery that possesses a dynamic internal compliance of 5-7% per 100mmHg applied pressure. 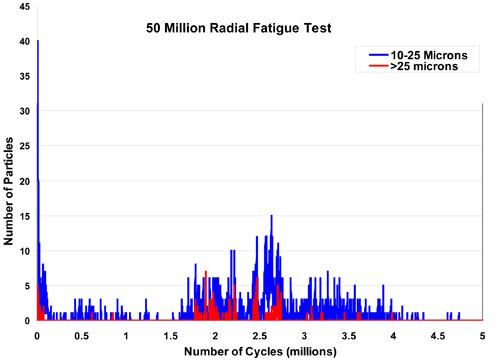 Next, the amount of deflection of the deployed stent per cycle is determined. This stent deflection is usually measured with high-speed photography while pulsing the mock artery with its deployed stent from 80 to 160 mmHg at 72 beats per minute. This deflection number is then used as the target during the setup of the instrument itself. Of course, this means that these experiments must be done before the particle shedding experiments are initiated. In addition, this deflection test can be used to determine expected pressure differentials that result from increasing the pulsing frequency above 72 beats per minute. By doing this pre-setup test, the initial set-up is made easier by allowing the investigator to get close to desired deflections sooner, saving time and resources. Another important step before the beginning of the experiment is sterilization of the unit. As a first step, sterilization involves rinsing and then flushing with a 70% solution of isopropyl alcohol. In general, this seems to be effective, but some samples have a tendency to introduce bacteria and fungi. Combinations of the following approaches have been used effectively in these instances: First, an ultraviolet sterilizer can be incorporated into the adjunct flow loop just before the final filters. Although this kills most liquid-borne microbes, it does not address those cells that stick to the walls of the tester. In this case, an antimicrobial such as ProClinTM is usually added. If a more aggressive approach is required, a solution of sodium azide can be used. This toxic material is easily neutralized at the end of the test. Set-Up: Setting up the machine involves mounting mock arteries without deployed stents and running the machine at pressures and flows that represent those of the actual experiment as determined in the pre set-up portion of the experiment. This particular step is critically important in order to establish a baseline particle number. Using the systems described above, including the in-line filters, it is common to reach near zero particulates within several hours after setup. The goal is to prepare the instrument for the deployment of the stents and to establish as low a baseline (as close to zero) as possible. In most cases, particles ten microns and above will be brought to zero counts over reasonable periods of time with little trouble. During this time, temperature and flows are adjusted. If a testing loop shows a high-count background, it must be examined closely to lower background counts as much as possible. Figure 2 is an example from a recent experiment showing the drop in particle counts. As shown, it is possible to run this experiment with very low particle counts (baselines). This is vital to the reliability of the data coming from the subsequent experiments. 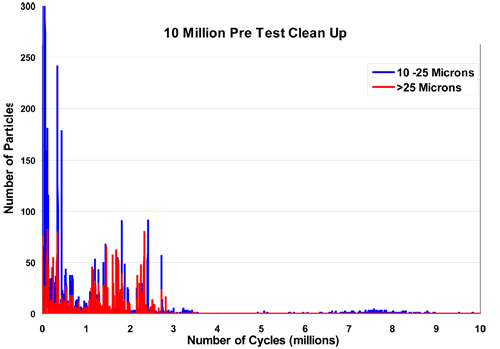 Figure 2: An example of the drop in particle counts during clean out. Sample Deployment: After the set-up phase, it is time to deploy the stent into the mock arteries. This design can use a Tuohy-Borst fitting for delivery of the stent using clinical deployment catheters. Not only does this allow for the use of a clinically valid technique to deploy these stents, it also yields some information associated with the acute phase of deployment, the delivery of particles from the catheters and balloons. Alternative methods of deployment are acceptable. In most cases, a rather large spike in particles will occur at this time. If this experiment is a long-term durability test, then the short burst of particles that appears at this time is usually recorded but ignored. There are procedures under development that specifically address the acute phase of the test . Setting Deflection: The setting of parameters for the durability test has been addressed in several documents from both the International Organization for Standardization (ISO) and the American Society for Testing and Materials (ASTM) [38-41]. In addition, although controversial in nature, there are two documents available for the use and calibration of particle counters [42, 43]. There is a critically important issue associated with all stent durability testing, whether or not particle counting is being done. All standards currently being written specifically state that unless one is using the physiological test method (mock arteries having physiologically relevant compliances at all testing frequencies that are used) the deflection of the stent must be monitored. If the monitoring cannot be done directly (for whatever reason) then empirical data must be used to specifically relate the measurement that is being made (e.g., outside diameter of mock artery) to a direct measurement of the stent deflection. Experience has shown that one of the most reliable methods available is the use of a high-speed photographic system. There are several adequate systems on the market, but the analysis software is as critical as the camera. In many cases, a group that is different from the developer of the camera produces the software. Compatibility is obviously a concern. Data Collection: The nature of the data collection depends a great deal upon the type of particulate counting and analysis one is doing. There are essentially three types of particle shedding experiments. These vary in the temporal relationship associated with the actual logging and storage of the data. Each is addressed separately below. One-Time Analysis: In this approach, a stent is exposed to pulsatile loading for a chosen period of time. Throughout this time, the fluid can either be held constant in the testing system or circulated through on top of a pulsatile signal. The basic concept is that no particle counting is attempted until the test is fully completed. In this way, difficulties associated with more comprehensive evaluation of particle shedding can be avoided. The disadvantage is that it yields a single number for one or more stents under test and cannot describe a time course of particle shedding. The biggest problem would be if one is required to interpret the total number of particles shed throughout the experiment as a bolus (as regulatory agencies may do). Another caveat during the testing of stents coated with biodegradable materials. Obviously, any particles shed could degrade with time. Intermittent Testing: In this approach, samples are taken from the solution and analyzed at regular time intervals. This approach also suffers from the same problems associated with biodegradable coating. One must know the total volume of the system to be able to translate the counts obtained to concentration per unit of volume. This approach does at least give more information as to the time course of the particle shedding. Although somewhat better than the single test at the end of the experiment, this approach still suffers from the interpretation problems associated with a phenomenon known to occur in stents: An event often results in a shower of particles rather than consistent steady release over the length of the experiment. Real Time: This represents the most rigorous analysis of particle shedding from a stent or medical product. This is the preferred technique because it allows constant monitoring of particle shedding from individual stents. If a single stent is deployed into each one of five mock arteries, data analysis gives a clear understanding of the history of particle shedding from each individual stent throughout the course of the whole experiment. Although the most challenging experimentally, it is the most informative and can give a very clear picture of the time course of particle shedding. This approach, of course, requires a modified particle counting system to reduce the amount of time that particle counts might be lost during intermittent data transfer to the logging computer. Figure 3 is an example of the time course of particles counting from a recent experiment. The presence of filters in the collection loops are critically important with the real time particle-shedding test. It is possible to have a separate set of filters for each sample so that a chemical analysis of the particles shed from a specific stent could be accomplished. Figure 3: An example of real time particle counts. The equipment and experimental protocols discussed have been found to be effective at evaluating the shedding of particles from intravascular stents and/or other devices that are coincidentally exposed to pulsatile durability loading. Also explored are issues associated with the actual tester and its modifications such that a real time test can be carried out with steady flow going through the particle counters. In addition, the use of filters to clean and remove particles from the flow during each cycle of the loop is necessary to give true numbers for each data point. Most high speed durability testing requires knowledge of the actual deflection of the stent each cycle throughout the test. A process at pre set-up is used to determine, under physiological conditions, what the target deflection of the stent should be. It is important that an initial clean-out step is performed with tubes without deployed stents. Conditions must be adjusted and components chosen so that the baseline can be obtained with particle counts very close to zero. It is possible in many instances to have baselines of zero for particles sizes ten microns and above before sample deployment into the mock arteries. Sample deployment can be done on the tester itself although a shower of particles is expected in the counters at this time. It is also possible to remove the tube and have the samples deployed off tester. This will generate even more post-deployment counts. Data collection will vary depending upon whether a single point, multiple points, or continuous approach to the analysis of particle shedding is chosen. The best procedure thus far is to perform stent deflection analysis directly through clear tubes and match the deflection with that found at 72 beats per minute and pressures of 160 over 80 mmHg to replicate physiological conditions the stent will experience. This is coupled with continuous real time testing, adjusting the characteristics of the particle counter to minimize any loss of data between logging. Using these techniques and this type of equipment, it is much easier to evaluate the continuous shedding of particles from stents that are being exposed to loads that cause a replicate of the deflection the stents will experience in vivo. Step Wise Protocol: Assumes all calibrations are complete. 1.) Acquire biologically compliant mock arteries for deflection studies. 2.) Choose physiologically relevant pressures. 3.) Deploy stent into mock artery. 4.) Determine stent deflection at 72 bpm and relevant pressures. 5.) Record pressure at elevated frequencies, if desired. 6.) Mount sterilization tubes and sterilize tester. 7.) Clean and rinse tester. 9.) Mount empty mock arteries and set size bins on particle counter. 10.) 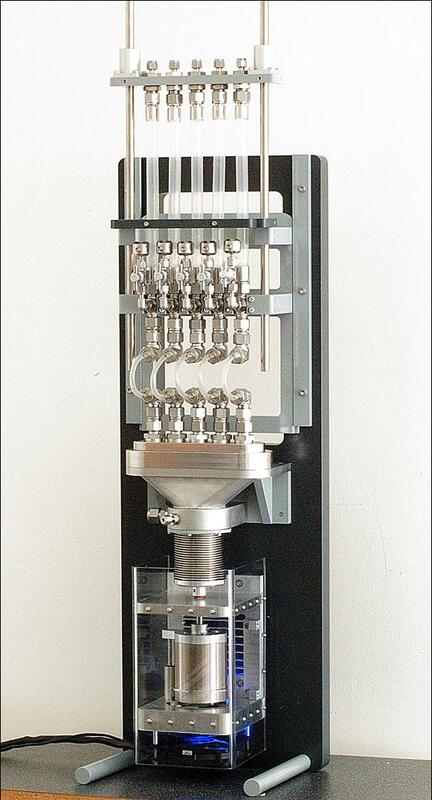 Fill tester with appropriate solution. 11.) Adjust bellow stroke to obtain pressure from #5, if desired. 12.) Adjust all parameters to obtain required steady flow through particle counter. 14.) Run tester until acceptable baseline counts achieved. 16.) Deploy stents into mock artery (unless other deployment chosen). 17.) Start tester and set all alarms. 18.) Adjust stroke and flow to obtain deflection from #4. 20.) Frequently inspect tester and recheck stent deflection as desired. 21.) Run until desired number of cycles is reached. 22.) Before shutdown, recheck stent deflection. 24.) Remove samples in mock artery. 25.) Drain system through counters. 26.) Rinse and drain tester with distilled water. We would like to acknowledge the assistance of the particle counting companies, in particular, Bob Bryant and Jim Evans of Chemtrac, as well as our loyal and supportive customers, clients, and colleagues who have assisted us greatly during the years it has taken to work out all of the equipment and protocol details that we have presented.